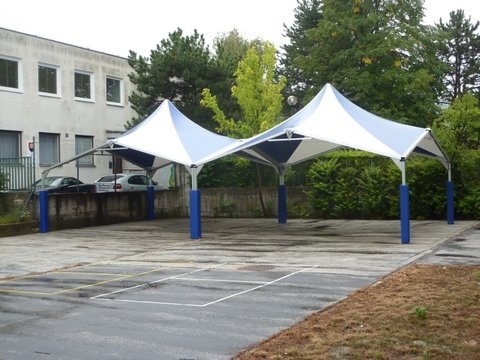 Aquila Shelters recently completed the installation of four outdoor shelters at the Bratislava British School in the Slovakian capital, adding to the total number of permanent tensile fabric structures installed throughout Europe (EU). Formed in 1986, and with outdoor canopies still in place after 20 years, Aquila is a well established supplier of high quality PVC coated shelters to the education sector, building and events sectors. 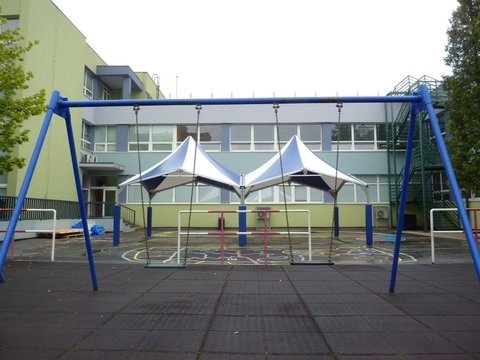 During a recent European trip, a member of staff from the Bratislava British School noticed a fixed outdoor canopy, prompting them to consider something similar for the school as a covered play area. 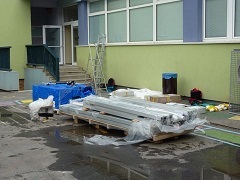 After failing to find a supplier specializing in school shelters in Slovakia, or any neighboring countries, the school’s business manager searched the UK. Aquila was identified as a leading school shelter provider for export. Aquila has already installed over 110 fixed canopies at Nurseries, Schools and Colleges throughout the UK in addition to roof-top shelters in Portugal. Engineered by a world leader in tensile structures, Buro Happold, designers of London’s world famous O2 Arena, our elegant and highly economical permanent shelters have graced playgrounds, playing fields, classroom extensions and social spaces for 20 years. 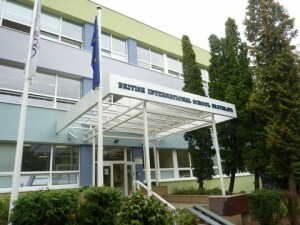 Four permanent outdoor shelters were installed for the Bratislava British School. 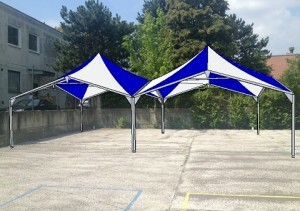 Within hours of receiving the enquiry the Aquila team produced numerous Sketch-Up rendered images of how the fixed canopies would look in the school playground. 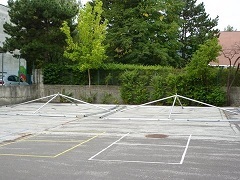 Once the school had completed a mini site-survey questionnaire to confirm the standard Aquila shelter sizes would fit, an installation date was set. 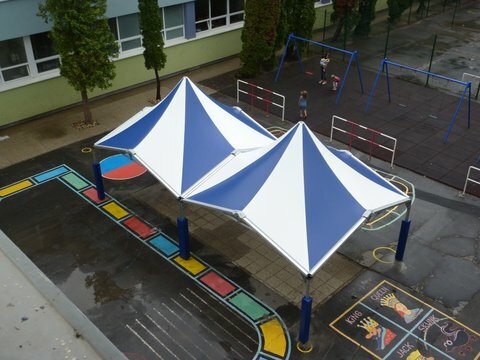 Typical lead times for Aquila’s school shelters from order date to installation is 4-weeks and this was met in the case of Bratislava, meaning the outdoor canopies were in place before the start of the new school term. Aquila’s outdoor shelters are constructed from aluminium alloy and PVC coated tensile fabric. With a load-bearing capacity of 1 tonne each individual shelter is an extremely strong highly effective permanent outdoor shelter solution. 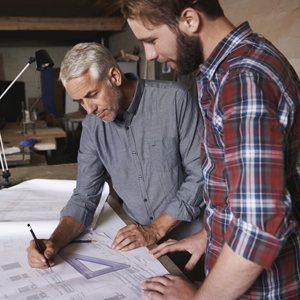 The advantage of using the materials is they are lightweight, making the shelters very cost effective to manufacture, transport and install. In many cases Aquila’s school canopies can be secured to existing buildings and to hard or soft standing ground surfaces, without the need for major groundwork. Once we ensure there are no underlying services or soft areas, rawl-bolts, or deeply driven steel stakes, are used to fix the structure safely. Each structure has a design life of 10 years however, in most cases our shelters have far outlasted this period. 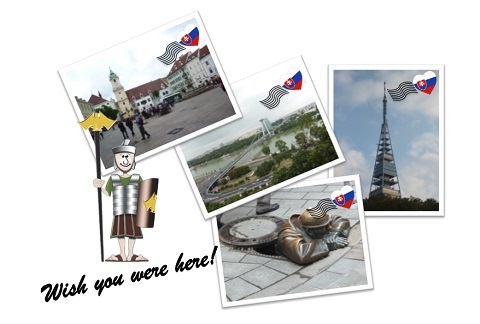 Installation of the four shelter canopies was completed a day early, leaving the installation team and ‘Portentus’ the Roman Aquilifer to enjoy the beautiful European city of Bratislava before returning to the UK.